As originally proposed by Feucht BU, 1980, the phosphorylated form of Enzyme IIAGlc acts as an activator of adenylate cyclase. During glucose transport, a decrease in the concentration of phosphorylated Enzyme IIAGlc takes place, which correlates with a decrease in adenylate cyclase activity. Therefore, in the presence of glucose, the cAMP level is low as compared to other carbon sources. It is to be understood that any regulation affecting glucose transport will also affect phosphorylation of Enzyme IIAGlc, and thus cAMP synthesis. Regulations affecting synthesis of Enzyme IICBGlc are therefore briefly reported below. By producing a low cAMP level, glucose transport indirectly impairs CRP-cAMP-dependent synthesis of most PTS-permeases, which requires higher levels of cAMP. Consequently, when several PTS-sugars are present in the culture medium, glucose may be taken up preferentially. To be mentioned, synthesis of Enzyme IICBGlc, the glucose permease encoded by ptsG, is also positively controlled by CRP-cAMP however it is additionally regulated by the Mlc protein, a glucose inducible transcriptional regulator (Plumbridge J, 1998; El Qaidi S, 2008) previously characterized as the product of the mlc (making large colonies) gene (Hosono K, 1995), and whose effect on ptsG transcription may be perceived as superseding the effect caused by the low level of cAMP. In fact, during glucose transport, transcriptional repression of ptsG by Mlc is abolished due to binding of Mlc to the unphosphorylated form of Enzyme IICBGlc (Lee SJ, 2000). The influence of RpoS, Mlc and cAMP on ptsG expression under glucose-limited and anaerobic conditions was analyzed by Seeto S, 2004. The complex regulation of ptsG expression in E. coli was elegantly reported by Jahreis K, 2008. Transcription of ptsG was found to be even more complex than previously thought, with the discovery of an antisense transcript (Pennetier C, 2010). Under conditions where intracellular glucose-6-phosphate accumulates, ptsG mRNA is degraded due to transcriptional activation of sgrS (encoding the small RNA SgrS) by SgrR (Vanderpool CK, 2004; Maki K, 2010). The sugar efflux transporter A (SetA) also contributes to the glucose-phosphate stress response (Sun Y, 2011). The effect of SgrT on the transport of glucose, as reported by Lloyd CR, 2017, must be taken with caution, Comment. Since the proposal by Feucht BU, 1980 that the phosphorylated form of Enzyme IIAGlc acts as an activator of adenylate cyclase, data have accumulated which emphasize a crucial role for phosphorylated Enzyme IIAGlc in adenylate cyclase activation, as reported below. First, the role of phosphorylated Enzyme IIAGlc as an activator of adenylate cyclase was exemplified by the so-called CRP-dependent activation of adenylate cyclase (Crasnier M, 1990). Second, under specific conditions, an entry for glucose exists involving Enzyme IIAGlc and a protein designated MalX, the product of the malX gene. This entry is not effective in wild type strains but in mutant strains lacking both Enzyme IICBGlc and mannose-specific Enzyme IIC and IID (which can be used for glucose transport), The MalX protein of Escherichia coli. Phosphorylation of MalX by phosphorylated Enzyme IIAGlc also correlates with a decrease in adenylate cyclase activity (Crasnier-Mednansky M, unpublished results). Finally, mutants of Enzyme IIAGlc that have lost the capability to be phosphorylated failed to activate adenylate cyclase (Reddy P, 1998). The proposal adenylate cyclase is inhibited by α-ketoacids independently of Enzyme IIAGlc must be taken with caution (You C, 2013, Comment; Huergo LF, 2015, Comment). On the other hand, unphosphorylated Enzyme IIAGlc is known to be involved in regulations for controlling the transport of non-PTS carbon sources by inducer exclusion. Unphosphorylated Enzyme IIAGlc can inhibit by direct interaction the permease of non-PTS sugars, for example the lactose permease LacY. By blocking the entry of lactose, and subsequent formation of the inducer of the lactose operon (allolactose), Enzyme IIAGlc indirectly prevents synthesis of β-galactosidase. Inducer exclusion can be observed on minimal medium plates supplemented with X-gal (5-bromo-4-chloro-3-indolyl-β-D-galactopyranoside), a colorimetric substrate for β-galactosidase. When β-galactosidase is present in the cell, X-gal is hydrolyzed and colonies appearing on plates after an overnight incubation are blue. However, when glucose is added to the plate, colonies are white due to inducer exclusion. The three-dimensional structure of Escherichia coli lactose permease was solved by Abramson J, 2003, About the Cover. For a global perspective, it is of interest to read "Membrane protein doppelgangers" from The Scientist, August 25, 2003. Lactose permease belongs to the Major Facilitator Superfamily (MFS) of transport proteins. Its mode of action, as reported by Abramson J, 2003, is astonishing for its simplicity; lactose permease acts as a "gate-keeper". The gate opens when lactose binds to the sugar binding pocket unless glucose is available to the cell, in which case the gate remains closed. Amino-acids essential to sugar recognition play a dynamic role in the opening of the gate (Vázquez-Ibar JL, 2004). Additionally, during sugar binding, measurement of interhelical distance changes supported the proposed mechanism involving access of the sugar binding site to either side of the membrane (Smirnova I, 2007). Thus, the sugar binding site is alternately accessible to the periplasmic and cytoplasmic side of the membrane during the reciprocal opening and closing of the gate, as further demonstrated (Smirnova I, 2009), and conclusively established (Kumar H, 2014). Opening and closing of the gate involves opening and closing of a large periplasmic cavity (Zhou Y, 2008) with the opening being the limiting step for sugar binding (Smirnova I, 2011; 2013). The structure of LacY with a high-affinity lactose analog (an α-substituted galactoside) was reported, allowing analysis of LacY specificity and affinity for sugar (Kumar H, 2015), and electrogenic events linked to lactose permease activity were investigated (Garcia-Celma JJ, 2009). Solving the molecular mechanism underlying lactose transport really has marvelously magnified the comprehension of the inducer exclusion process. In 2009, inducer exclusion was reported to be primarily responsible for carbon catabolite repression of the lac operon. However, the proposal by Narang A, 2009, cAMP does not have an important role in carbon catabolite repression of the Escherichia coli lac operon, ignored data pertaining to the glucose-lactose diauxie as well as data by Wanner BL, 1978 (Comment). This proposal was reiterated in 'Classic Spotlight: When Phenotypic Heterogeneity Met Carbon Catabolite Repression' (Becker A, 2016, Comment). In order to reconcile data, a model was proposed implicating cAMP in the glucose-lactose diauxie (Correspondence, Crasnier-Mednansky M, 2018). Unphosphorylated Enzyme IIAGlc inhibits uptake of several other non-PTS sugars by binding to their transport systems. It also inhibits glycerol kinase by direct binding thereby preventing inducer synthesis. 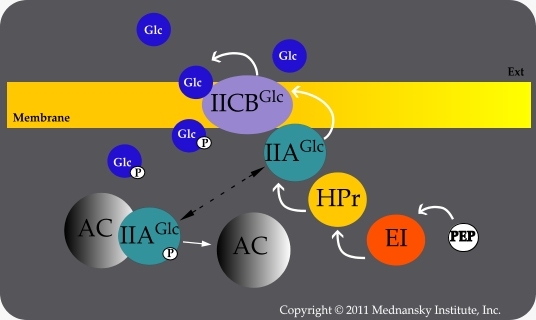 Specific molecular interactions between unphosphorylated Enzyme IIAGlc and its target proteins have been identified, for examples the MalK subunits of the maltose transporter (Blüschke B, 2006) and glycerol kinase (Hurley JH, 1993; Enzyme IIIGlc was renamed Enzyme IIAGlc). Crystals of the maltose transporter (MalFGK2) bound with Enzyme IIAGlc were obtained and further characterized by Chen S, 20131, again leading to a molecular understanding of inducer exclusion. At RCSB PDB, you may enter IIIGLC and GLYCEROL KINASE as keywords, or MALFGK2, for structural data. An interaction between unphosphorylated Enzyme IIAGlc and the product of the yafA gene (renamed frsA for fermentation/respiration switch) was reported (Koo BM, 2004). Such interaction may possibly interfere with the regulatory functions of Enzyme IIAGlc. The yafA gene is adjacent to the gpt gene and transcribed from its own promoter (Nüesch J, 1984). The product of the yafA gene (or FrsA) was classified among databases as a putative hydrolase of the α/β super family. An interaction was demonstrated between unphosphorylated Enzyme IIAGlc and the EAL domain of CsrD, a regulatory protein involved in the degradation of sRNAs by housekeeping nucleases (Leng Y, 2016, Comment). Also, CsrD-controlled CsrA bound specifically to crp mRNA with no major effect on CRP expression at 37 °C and possibly a slight effect at 22 °C (Pannuri A, 2016). Most importantly, regulation of adenylate cyclase and inducer exclusion are linked together because any change in the ratio of phosphorylated over unphosphorylated Enzyme IIAGlc will affect both phenomena. 1The title of the article by Chen S, 2013, Carbon catabolite repression of the maltose transporter revealed by X-ray crystallography, is inaccurate and misleading. A better title would have been related to inducer exclusion, not carbon catabolite repression.